Complete fixing kit for a water pump, includes replacement bypass hose, clips, superseal gasket, replacement bolts and washers. This kit designed for all pumpa with by-pass and dynamo lug. This Alloy water pump pulley is a direct replacement for the standard discontinued stamped steel, single belt water pump pulley used on all A-Series engines. Outside diameter is 98mm. 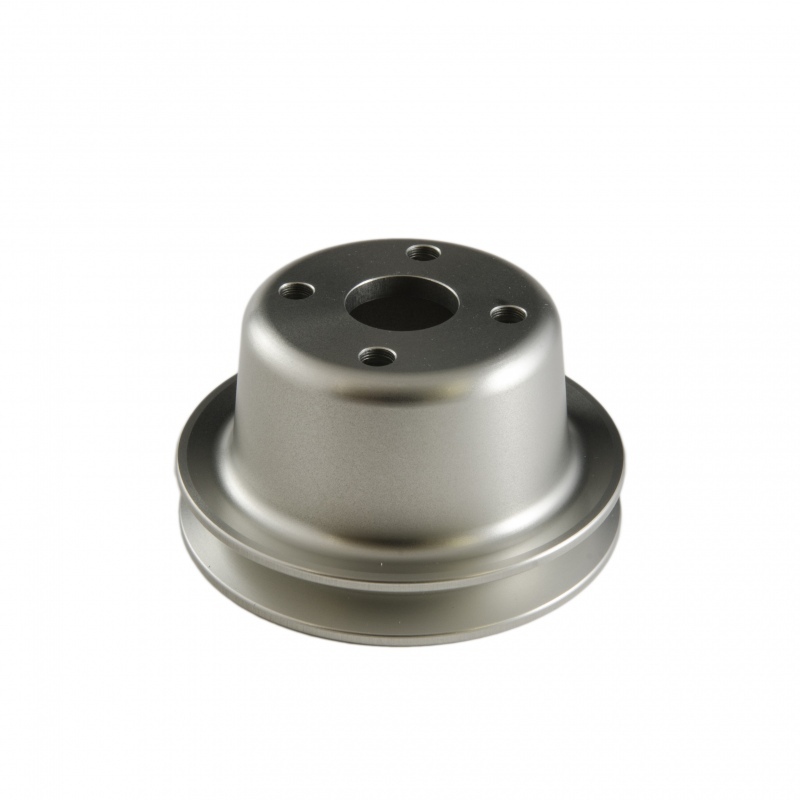 These pulleys have a thicker front face, so if you currently have the 4mm spacer behind the fan, you will no longer need to use this. Available in Black, Blue, Red via special order (allow 6 weeks). 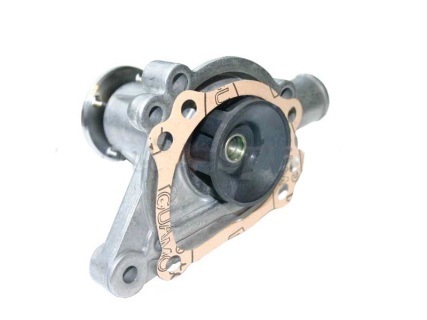 the GWP132 water pump has the by-pass hose take off. This pump was original equipment on the 803cc, 850cc, 948cc, 997cc, 998cc, and 1098cc engines. These pumps have the same aluminum housing with the deep cast impeller and the by-pass hose take off. This higher capacity was original equipment on the 1275cc engines ( AH Sprite (C) 72034, MG Midget (C) 60441 and moves more coolant then smaller impeller pumps on the 948-1098 engines These water pumps have the much larger impeller, it sticks into the block very slightly more than 1/2"(14.03mm). This water pump will fit all 1275cc blocks and all small bore blocks 948-1098. May be retro fitted to all earlier A-Series Engines for more capacity. 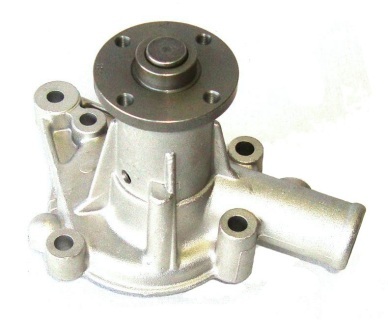 Fitted with a PPS, glass filled plastic impeller as used by Aston Martin and Jaguar it reduces weight on the bearing loading and has a triple lip seal giving a better controlled flow rate through the rev range.The pump is about 130 grams lighter and has the rolled edge gasket facing evolved for better sealing. Tested with coolant pumping at 10,000 rpm with no detriment to the PPS impeller this larger impeller pump moved more coolant than the original early standard pump. The GWP134EVO has the by-pass hose take off. These water pumps have a much larger impeller, it sticks into the block very slightly more than 1/2"(14.03mm). 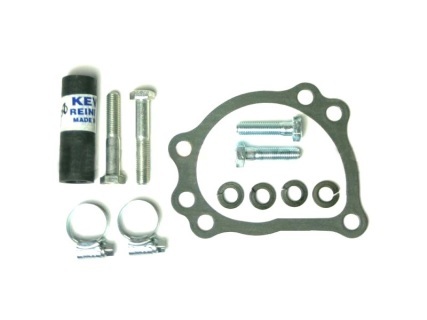 This water pump will fit all 1275cc blocks and all small bore blocks, with the exception of early 850/997cc units. These early blocks will need an amount of modification, relieving corrosion and slight material from the liner wall and impeller if required should enable clearance, try spinning pump loosely fitted without gasket for clearance. 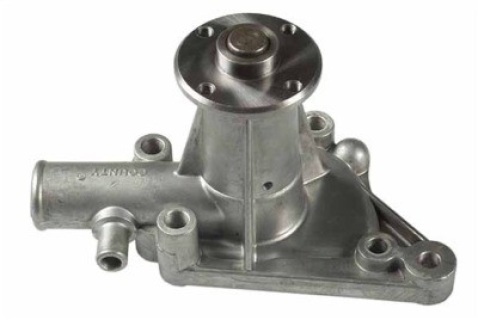 The high capacity water pump helps to reduce cavitation in the water jacket, particularly at high RPM, as well as circulating a greater volume of coolant. Further reduction of cavitation is achieved by using a large diameter water pump pulleys. When using a large diameter pulleyit is necessary to check clearance between the large pulley and the head, if a lot of material has been machined from the head face as it may foul the pulley function. These pumps have the same aluminum housing and the same deep impeller as the standard GWP134 pump, the only difference is that the bypass adapter has not been drilled. This means that if you are running without a bypass hose you don't need to plug it, therefore one less possible leak. This pump moves the same amount of coolant then as the GWP134 pump. These water pumps have the much larger impeller, it sticks into the block very slightly more than 1/2"(14.03mm). 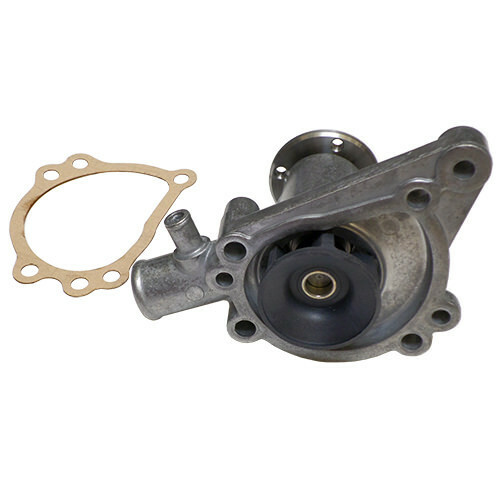 This water pump will fit all 1275cc blocks and all small bore blocks 948-1098. May be retro fitted to all A-Series Engines for deleting water bypass. The GWP187EVO does not have the by-pass hose take off. 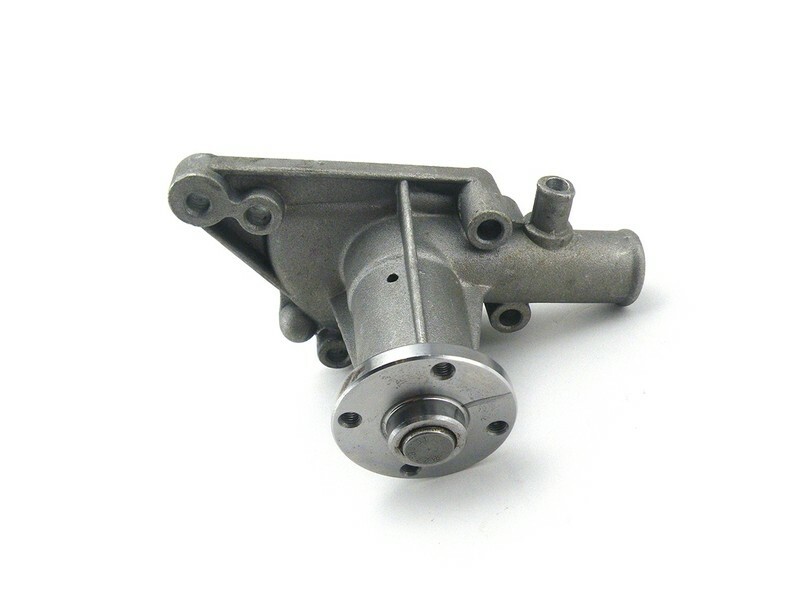 These water pumps have a much larger impeller, it sticks into the block very slightly more than 1/2"(14.03mm). 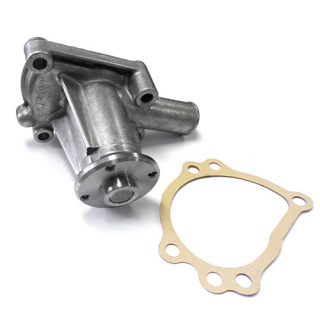 This water pump will fit all 1275cc blocks and all small bore blocks, with the exception of early 850/997cc units. These early blocks will need an amount of modification, relieving corrosion and slight material from the liner wall and impeller if required should enable clearance, try spinning pump loosely fitted without gasket for clearance. The high capacity water pump helps to reduce cavitation in the water jacket, particularly at high RPM, as well as circulating a greater volume of coolant. Further reduction of cavitation is achieved by using a large diameter water pump pulleys. When using a large diameter pulley, it is necessary to check clearance between the large pulley and the head, if a lot of material has been machined from the head face as it may foul the pulley function. The GWP188EVO does not have the by-pass hose take off nor the take off for an alternator/generator.This pump is dimensionally the same to fit but is just missing the lug that the generator or alternator bolted to--The Mini with MPI and a front mounted radiator used a different fixing arrangement. These water pumps have a much larger impeller, it sticks into the block very slightly more than 1/2"(14.03mm).